Very stylish! Looks cool and refreshing there. Just got real hot here in LA everyones in shorts and t-shirts and not a whole lotta style either. 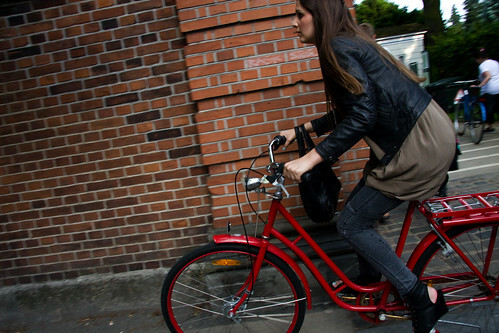 the red red bike ...the shoes ...the outfit!! and I love the way the photo is cropped - she really looks like she's moving there. Nice bicycle, nice look...I´m just not into the shoes like you..don´t like it.